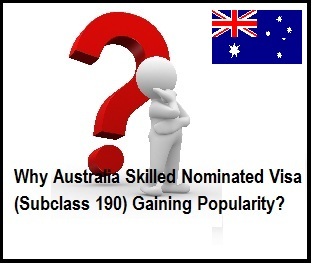 Why Australia Skilled Nominated Visa (Subclass 190) Gaining Popularity? Australia is known to be a vast continent that does provide a diverse range of lifestyle choices. It has striking deserts, rural landscapes, and picturesque beaches, usually we find most individuals who prefer to migrate to Australia do look to gain experience of a lifetime and not to forget, a bit of adventure in this nation. Besides, Australia has eye-catching hot spots, healthcare, cosmopolitan and excellent infrastructure.This country is also referred as kangaroo land, and it offers lucrative career and employment prospects. Why One Should Choose to Immigrate to Australia? Australia is also referred as down under, it is a great place to work, live and study. The skilled overseas professional who possesses the specialized skills, as well as qualification, do have a strong will to work for their economy, and they can choose to apply for work visa of Australia to fulfil their career goals. If the individual lives in overseas and they would like to grab the opportunity to work and settle in their dream destination (Australia). First of all, they need to find out varied visa options offered by the nation. Furthermore, if the individual is skilled in particular qualification and expertise that the country is experiencing the shortage, they need to make use of the skill select and try to receive an invitation to apply for this work visa issued by Australia. The skills select permits the skilled professionals as well as business people to submit their expression of interest for the skilled visa. In general, a range of temporary and permanent skilled visa paves the way for permanent residency of Australia. DIBP (Dept of Immigration and Border Protection provides over 100 visa options for applicants to live and work in Australia). This is points based migration program, which permits the individual to live as well as cooperate in OZ on a permanent basis. This nation is also called as land of opportunities, as it offers the best chance to prosper and lead a successful life. Hello, I am Prakash. I am working as resident medical officer in western Australia. I would be getting my general registration in 2 months after that my degree would be equivalent to Australian standards. But I am not sure under which subclass I can lodge application for PR. If you can assist than I would like to have some more information regarding this. Am having problem signing my online application, who do I contact for assistance?